Opening in 2016, the National Railway Museum commemorated the anniversary of the First World War by recreating the untold story of ambulance trains. This HLF-funded programme brings to life the emotive and untold stories of staff and passengers through digital projection, film and sound. 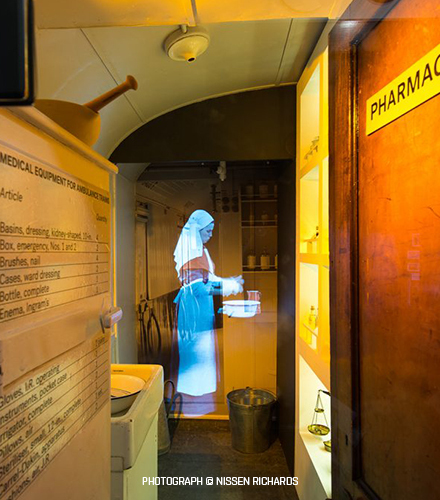 The recreated ambulance carriage forms the centrepiece of the exhibition and immerses visitors within layers of multi-sensory interpretation providing the experience of travelling as a passenger or a medic. Stories of staff and passengers are shared in their own words through rare wartime letters, diaries, photographs and drawings. The carriage is divided in to three main sections which consist of the Ward, the Pharmacy and the Nurses’ mess. Each area immerses visitors with its own soundscape and projections in the Ward and Pharmacy area recreates an environment that conveys the experience of those on board the carriage.